"Try it, you might like it" - it's what someone says when they present you with some food you've never had before or your mom wants you to try on some clothes she picked out for you. I'm using it here on the blog as inspiration to choose books in genres I don't normally read; to branch out from my reading comfort zones; and to maybe find some new favorites! For this installment, I've chosen short stories - or rather, short stories chose me. I was browsing the new release shelves at my library and Jojo Moyes' distinctive font caught my eye. At first I was a little reluctant to check out Paris for One and Other Stories (2016), but since I loved Me Before You so much, I decided to give it a try. From the #1 "New York Times" bestselling author of "Me Before You" and "After You," a sensational collection featuring the title novella and eight other stories. Quintessential Jojo Moyes, "Paris for One and Other Stories" is an irresistibly romantic collection filled with humor and heart. I think there must be a real art to writing short stories - being able to create characters and a story arc in just a few pages, adding just enough detail so the reader understands what's going on without inundating them. I think Moyes was successful here in that each short story (and one novella) felt mostly complete; I was able to get a clear sense of the characters and what was happening in each story, without the benefit of many pages and chapters of background. Some of them had twist endings, which helped. The novella is a cute story about a woman stood up by her boyfriend who makes the most of a weekend in Paris; it's quite romantic and hopeful, but almost a bit too sweet. However, some of the stories were just strange - particularly the ones about a robbery at a jewelry store and a woman finding someone else's cell phone. There wasn't anything particularly special about most of them. They are all told from a female point of view, and many feature an unhappy woman who is taking control of her life. The writing was good, but not great. My issue with short stories is that I just want more - I know I said the stories here felt mostly complete, but in a lot of the cases, I wanted more detail. The stories could be fleshed out, particularly the stories about long marriages. I wanted to know how the characters got to these places in their lives instead of being dropped in, in the middle of the story. It's hard to feel connected or invested when you only get a few pages. This is such a great idea for a feature! I definitely should read outside of my comfort zone a bit more often, so it's fun to see your recommendations! I definitely don't read a lot of short stories, but I might pick up these by Jojo Moyes - though I do fear that I won't have enough time with the characters to get invested, like you also pointed out. Thank you so much, Lindsey! 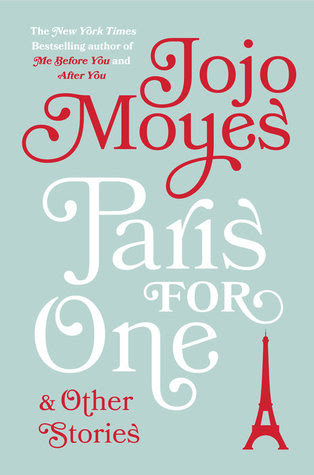 If you're a Jojo Moyes fan, you may want to try this one. The novella is cute. I do find it hard to get in to short stories as I find there isn't enough room for all the character development that I love. Like you said it's hard to connect, as just when you are getting to know them, the story ends. Exactly! I feel like I want to know the characters more and there just isn't time for that. Yeah I am mixed on short stories. I feel like I want more especially if it is good. I tend to stay away from them though I have been tempted by the Jojo Moyes one. I guess I just don't really get short stories - I'm just like, what's the point? Yeah, some of them were cute little anecdotes, but others... I guess I just didn't get it.